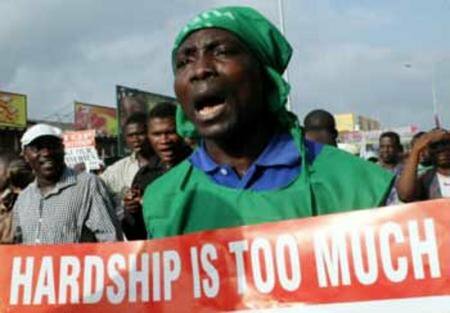 The Nigeria labour congress and Trade union congress have suspended the three day warning strike but resolved to meet again in December to evaluate the government's progress on meeting its demands for a higher minimum wage. LMFAO at all my friends who were glad to be off!!! God bless all the parties involved for takking the right decision. ....Rubbish strike..N18.000 peanut! Not up to one bottle of Moet for my joint! Rubbish..they should have requested for N180,000 instead! mmsschheeeewww!!! Why did they call off the strike even before they start? I think it is only a segment of the workers that called off the strike (the ones that are still working). PHCN as far as I am concern are perpetually on strike since we no dey get light for our side, water board as well are forever on strike, govt ministries work halfday, they arrive in the office at 11.am and sneak out of the office at 2.00pm. We have since taken solace in borehole and generator. Soon evrybody will have his/her own hospital, university etc and the government will have absolutely nothing to worry about but looting spree until the country becomes broke (Abi elephant meat no dey finish?). oloshi! Who should be the next Super Eagles Captain?